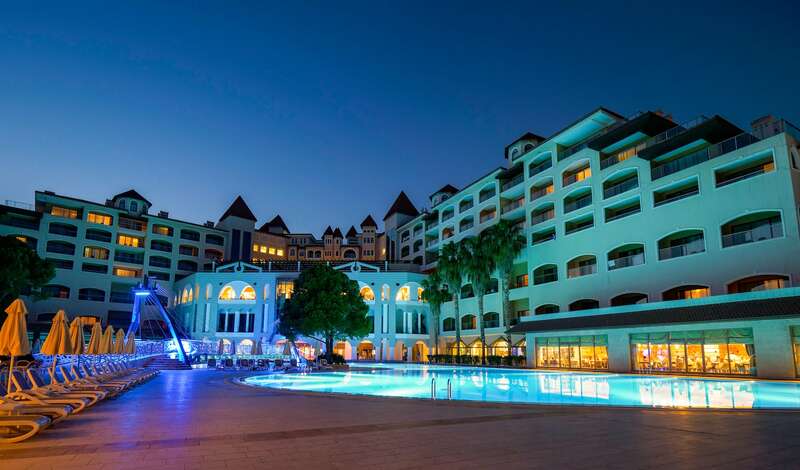 Sirene Belek Golf & Wellness Hotel is located perhaps in the most beautiful point of Belek Tourism center which is receognized as the pupil of the Turkish Tourism and which makes us feel the magic of the costal band. The design of the hotel is featured with its modern and aesthetic architecture attaching impostance to the living spaces of its guests. 5 star hotel build on 120.000 m2 field. Builded in Mediterranean architectural style and has 444 rooms. Main Building with 4 elevators and 6 storeys. Also there are 5 Villa blocks 2 or 3 storeys Central heating system. We do not accept any pets to our facility. The Hotel serves Ultra All Inclusive concept both on winter and summer seasons.24 hours room service is available through the menus in the Rooms.. Non Smoking floor is available. There are 209 Standard Junior Suites in total, having an area of 47 m², four of which are shaped in line with the needs of the handicapped guests. The rooms feature 2 single beds or 1 double bed, and 1 sofa. The sofa can be used as a child bed up to 12 years of age. In front of the sofa, 1 high coffee table and 2 armchairs are available. There are 7 Palace Duplex rooms in total with an area of 80 m². The first floor features 2 single beds and other common room qualities. The second floor has a bedroom that includes a double bed. Each floor of the rooms has separate bathrooms and toilets. A total of 9 rooms have an area of 95 m² . They contain a bedroom, living room, 2 bathrooms and a 60 m² quite wide terrace of 60 m². The terrace includes a private sunbathing area and deckchairs. The rooms designed with a useful area of 60 m² and 1 bedroom + 1 child room offer you a peaceful and comfortable holiday with your family. The Tulip Suite designed as duplex features beds for two people on the first floor, and a double bed on the second floor of the 80 m² area. You will feel the comfort of your home with the 120 m² area consisting of two bedrooms and one living room. The Pasha Suite, enabling even the largest families to have their holidays without making concessions to comfort, will let you experience a holiday beyond your dreams by its 150 m² duplex design, and 4 four rooms consisting of 3 rooms and 1 salon. The menus created by those who are professional masters in their own fields are offered in our hotel's restaurants in order for you to meet the pure samples of the Turkish and world cuisine. It is nearly impossible for you not to find foods appealing your taste in a total of 6 restaurants. 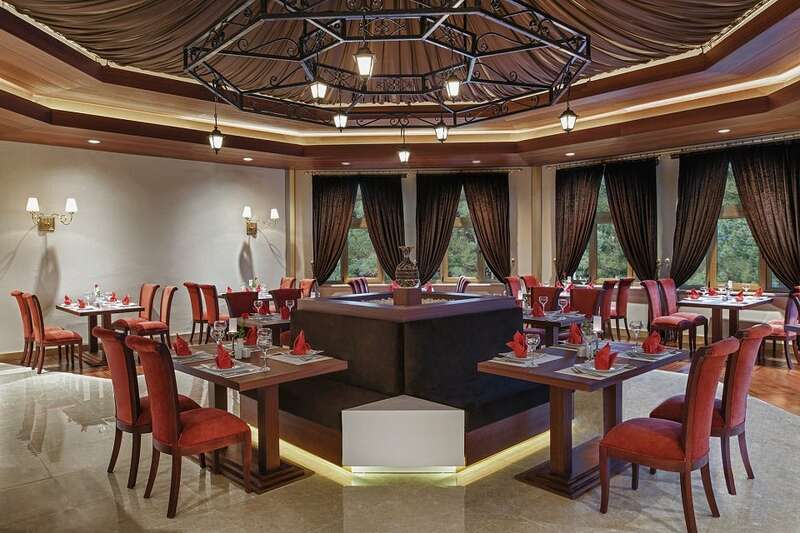 The wide and spacious restaurants with high ceilings are designed to make the eating a joyful feast. While you are living the joy of eating in a cosy and comfortable atmosphere, our kitchen will be at your service by its wide menu and rich options. 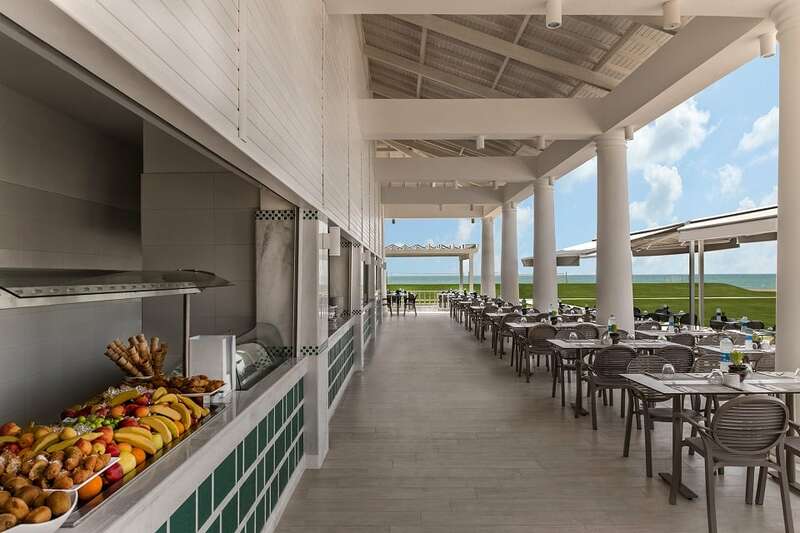 Offering its guests the wide culture of cuisine in the form of open buffet, Kybele Restaurant appeals to your taste and your eyes by its special design. 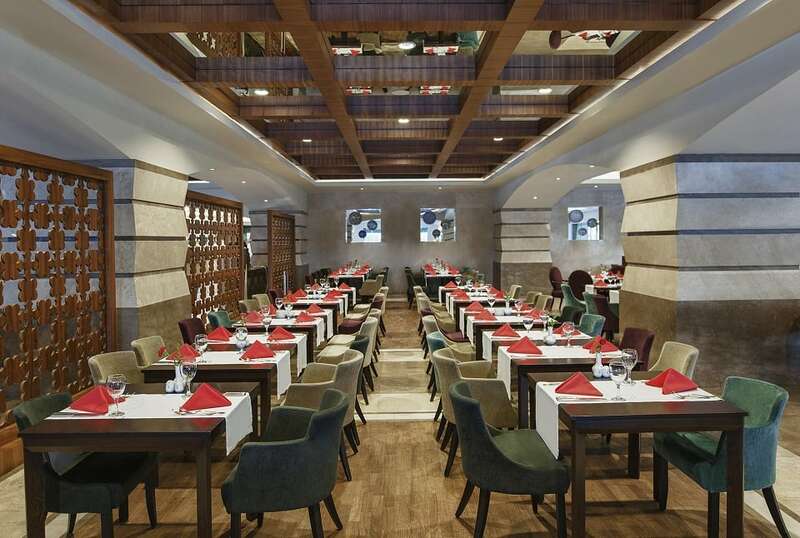 Located just in the heart of the hotel and of Offering the prominent Italian cuisine when it comes to the Mediterranean cuisine by the flavours selected diligently the chefs under the atmosphere that will make you feel like you are in Italy, Limone Restaurant is a place you will be quite pleased to be at. 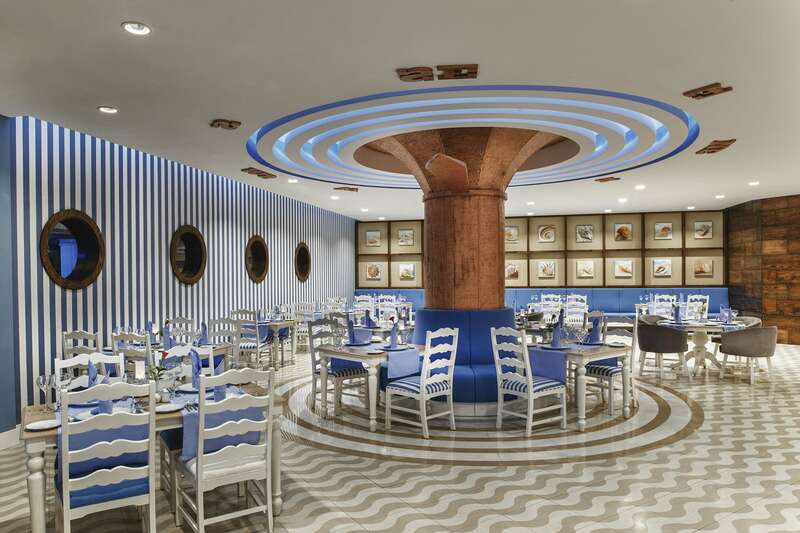 Mermaid Restaurant, where you will experience the insatiable flavour of sea products with the privilege of Sirene the Mermaid, will make contributions to your fish culture by its variety. One of the richest cultures of our geography, which hosted and continues to host many civilizations, is its unique cuisine. Sini Restaurant brings the most distinguished samples of this culture kneaded for hundreds of years together with its guests. 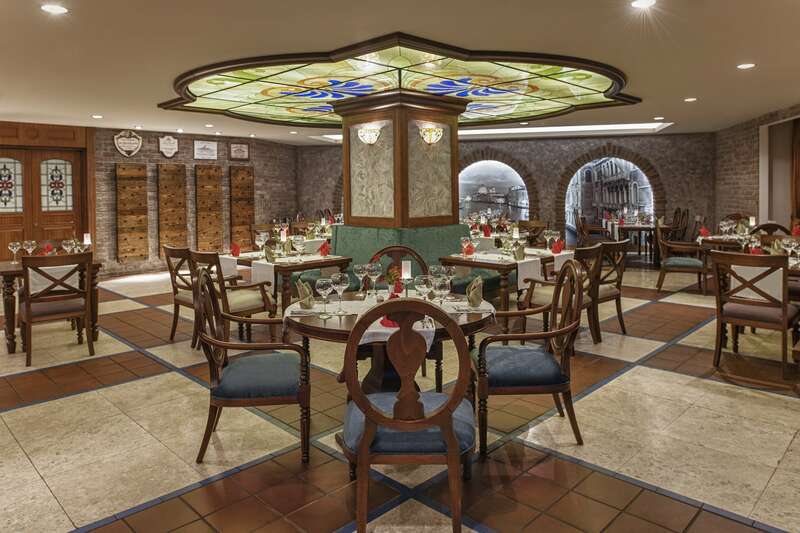 Sini Restaurant enlivens the kebab, one of the most well-known Turkish words, by its grill-side concept. The kebap presentations leaving legendary flavours in the mouths and the "grill-side" concept having a completely different culture let you have a dizzying experience. Dragon Restaurant that amazes by its architecture hosts its guests with its presentations of sushi, the most important flavour spreading to the world from Far East, and the distinguished flavours of the Chinese cuisine attracting the world's attention by taking a different culture to our tables. Bringing its guests with special flavours within natural beauties at the point where entertainment and a wonderful beach meet, Aspendos Food Court is a special snack restaurant by its fountain show pool and a neighbouring stage. There will be a bar almost anywhere you may need to refresh while you are at your holiday. Special drinks, world-famous cocktails, rich alcohol options and any and all kinds of hot drinks appealing to your taste are included in the menu for you in our 7 bars in total. Our barmen will prepare you the flavours you possibly have not tasted so far, by their creativities in their own fields. 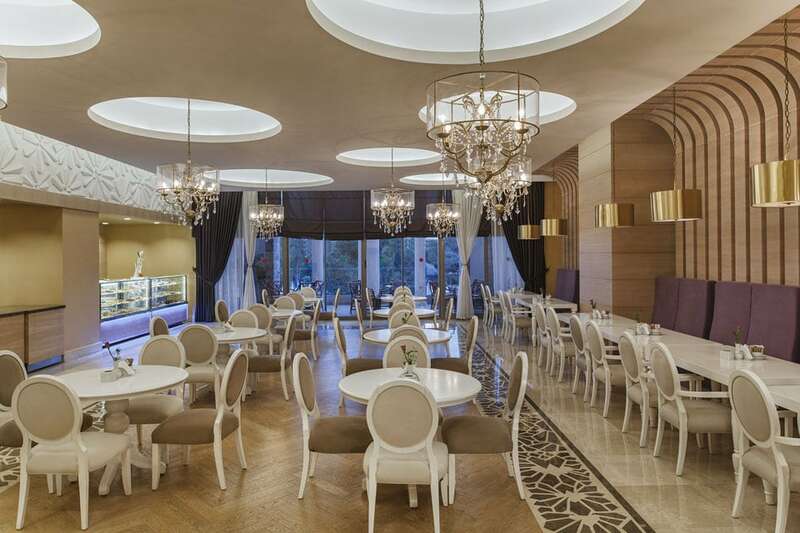 The patisserie, which is the favourite place of the guests during the day with traditional Turkish dessert options, dessert alternatives the world loves, snacks and drink offerings, hosts its guests by its quite joyful atmosphere. 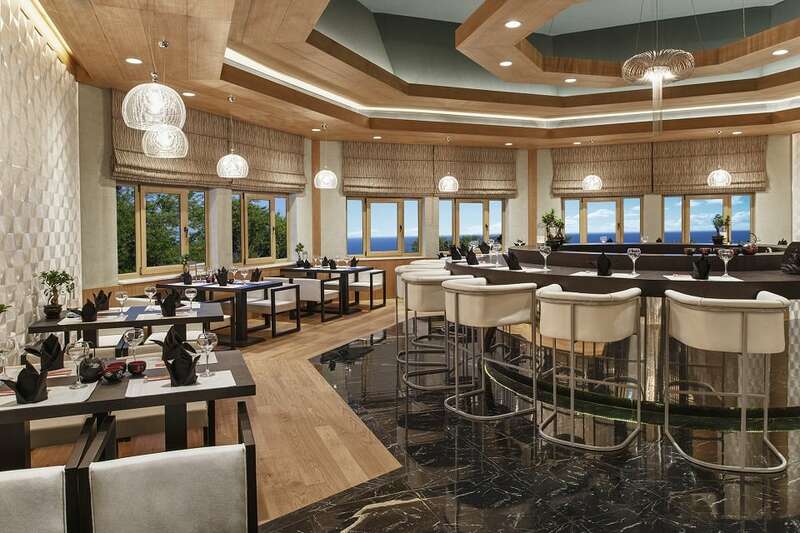 Lobby Bar, which brings the Mediterranean Sea with joyful moments besides being a place to go by its stylish atmosphere, hosts the guests knowing each moment's value. 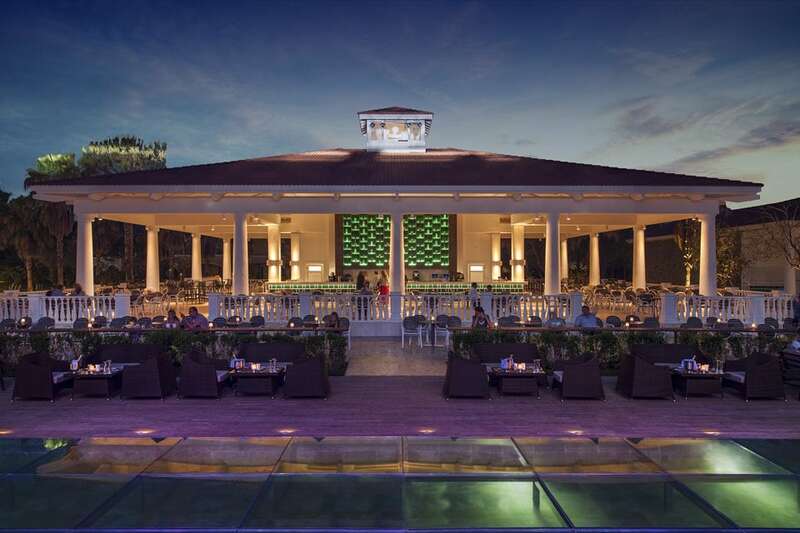 Hosting stylish parties with its elite design and atmosphere, Hoopoe Bar is also a popular hangout for golf lovers. 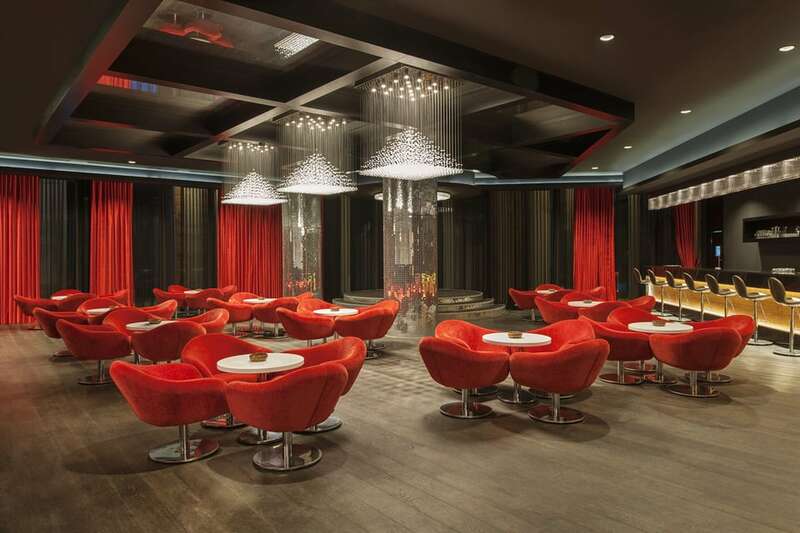 Hoopoe Bar, where new friendships are made and joyful and cheerful conversations are made in company with live music, will not have a hard time to attract you. 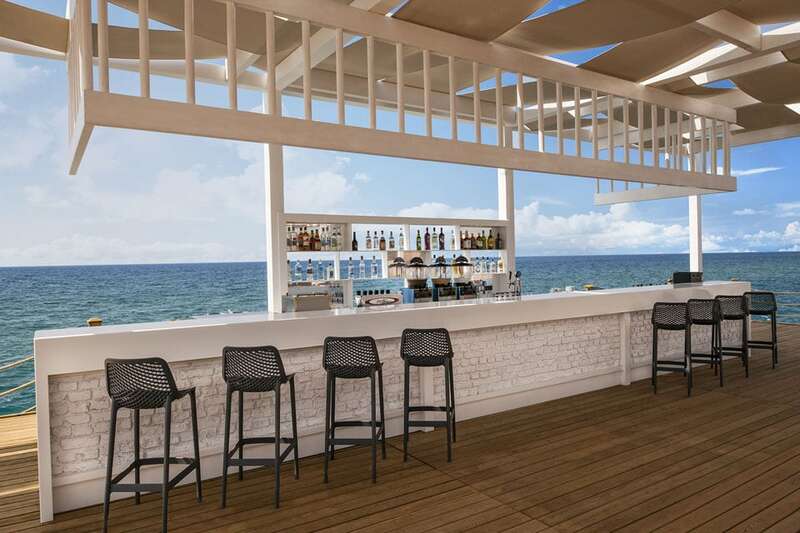 The Pier Bar located on a pier being assertive by the size of the area it is established in, brings comfort right onto the Mediterranean Sea by its tasty and distinguished drinks. You will spend the most peaceful and privileged moment of your holiday by the soft touches of the wind within the blue as far as the eye could reach, and bring flavour to that moment by local and foreign drink alternatives. 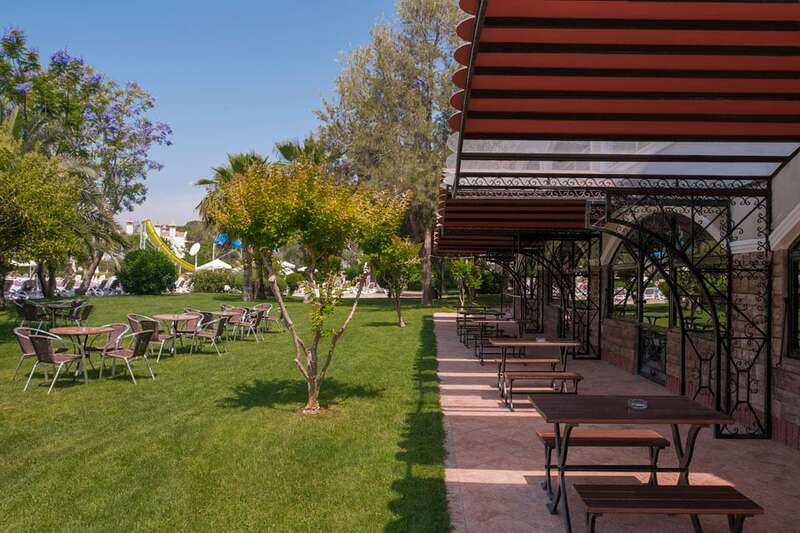 Located in Aspendos Food Court, Aspendos Bar provides service right next to the Mediterranean coast with its stylish setting and rich alternatives of drink. 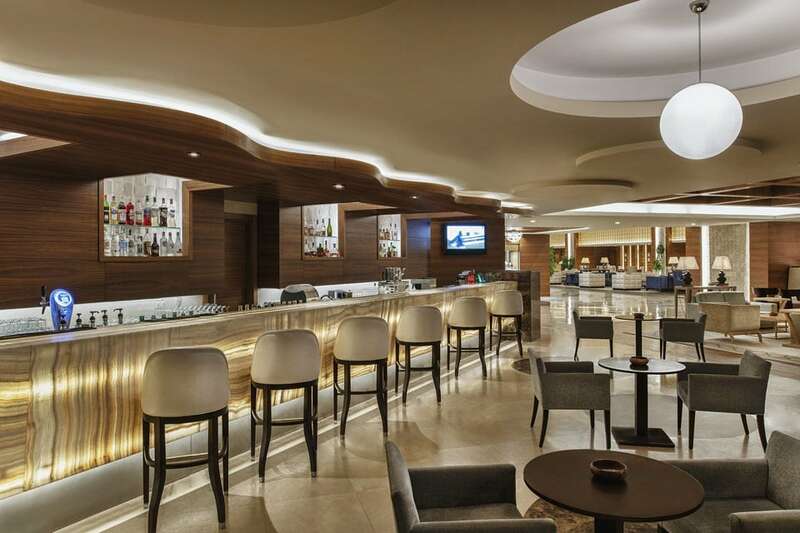 A neighbour to Aspendos Night Club, Aspendos Bar, which is specially designed for you to have joyful times, will host the most special hours of the day by its zone enabling you to fully watch the shows and entertainment. Located within the lush green garden right next to the Olympic pool, the Olympic Bar will become one of the most popular venues of your holiday with its atmosphere specially created for you to enjoy every minutes with its gaming zones and spectacular architecture. You will be refreshed with the tasty wide range of drinks and breathe life at the garden shadowed by the trees. 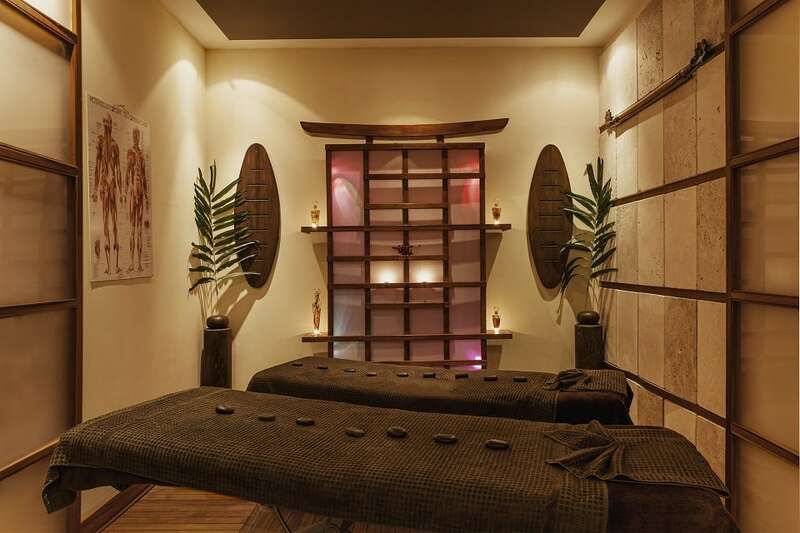 You will be completed renewed and regain your life energy by the Spa centre operated by Sanitas Spa, which provides professional service and is a leader in its field with many centre of its. You will indulge your body and soul with the care rooms, massages and body cares by which you will leave all the negativities caused by the daily life. You will meet health in the hands of the professional team by the wide opportunities offered by the centre where cares and massages supported by Turkish bath, sauna and indoor pool are provided.